Vitamin C - Aniruddha Enterprises Pvt. Ltd.
Micronutrients, play a major role in boosting the non-specific immune system or resistance to disease and environmental stress. Vitamin C, a heat sensitive vitamin, loses its’ structural properties & becomes ineffective during high temperature processing of pelleted feeds. Prawn & fish hence depend upon an exogenous dietary source of vitamin C.
Vitamin ‘C” plays a vital role in maintaining the integrity of connective tissue & is a vital co-factor in the biochemical reaction for the structural support tissue, collagen. Deficiency of Vitamin C can lead to reduced resistance to stress & disease, erratic molting frequency, skeletal deformities, poor growth and anorexia. ExCel* is a formulated Stable Ascorbic Acid composite which strengthens immunity, increasing resistance to disease & stress. 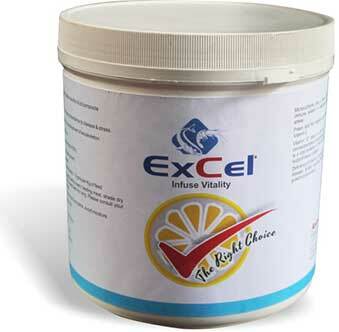 ExCel* helps in regulating molting & development of exoskeleton. Continual use of ExCel* improves Feed Conversion Ratio (FCR), increases survival rate & enhances growth.